Baby names! What are your favorite baby names? Did you get to use them with your kids? I have a few favorites and fortunately, I got to use 2 of those beautiful baby names with my kids in spite of a family tradition I follow. On my dad’s side of the family, we have a tradition. Growing up, I told myself that I would diligently follow that tradition to make the elders in my family happy. As soon as I knew I was pregnant, I immediately tracked the last letter used for naming the family’s newborn babies. My dad’s parents started the tradition. To top it all off, my mom has this superstitious belief of naming her grandchildren with just 18 letters including the last name! She is claiming that it will bring them good luck. I don’t know, but I really tend to follow everything my parents tell me even at 36. That’s the Asian in me, I guess. 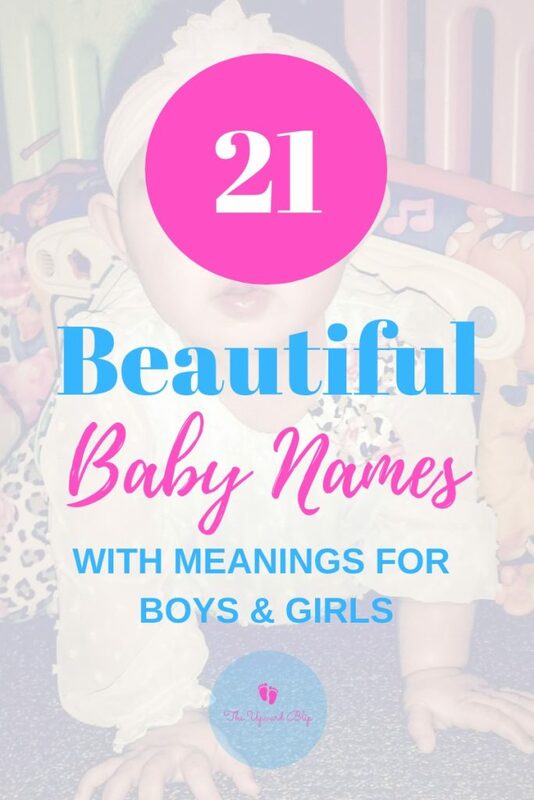 To cut the long story short, I needed to find beautiful baby names that would sound awesome without forgetting to follow a family tradition and a superstition. All these pushed me to do an exhaustive research on baby names and their meanings. Scary Mommy has a really good baby name database, if you want to check it out. Behind the Name has an extensive list too. I have an account with Babycenter and they have an array of amazing baby names to choose from as well. I found a few I fell in love with. Unfortunately, not all these names could be used as first names for my kids because of our family practice. That leads me to share them with you. 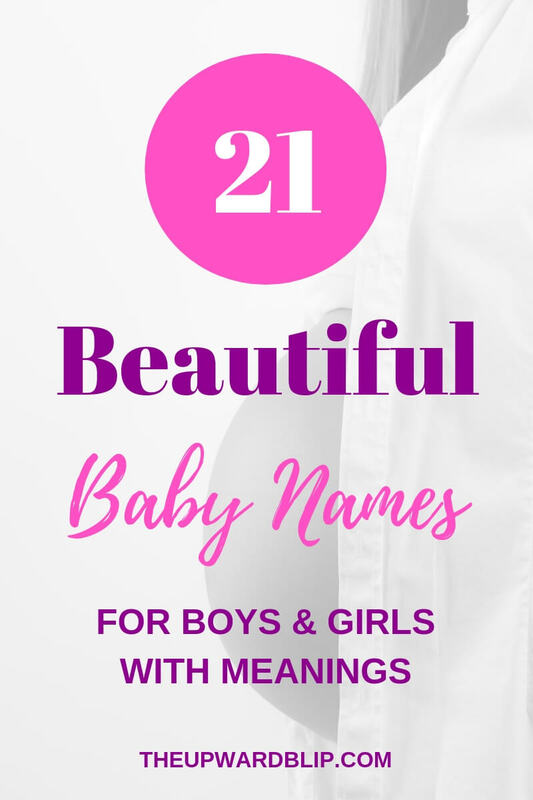 So, without further ado, here are 21 amazing and beautiful baby names with their meanings. Don’t you love the sound of it? It sounds exceptional. It may be gaining popularity a whole lot more these days, but I still find it very unique in a way. In different countries, Kai has different meanings. However, I was drawn more to the Chinese meaning of it as Kai means “victory” to them. Franco is another Italian name. I am more inclined to Italian names, if you notice. (Again, it is because my husband is a son of an Italian-American.) Franco is the Italian equivalent of Francis, which is derived from a Latin word meaning “Frenchman”. Fun trivia: Did you know that the French people are called Franks in the ancient times? (Now you know! Ha!) The Franks were a Germanic tribe (See the pattern here? German! My mother-in-law is German!) They later transformed into the French people. There is really nothing grand about Krew’s name meaning as it only means a group of people, but I really think it is trendy and preppy. A perfect name for a fashionable little boy! Change “c” to “k” and you get a cool variant of the word crew. 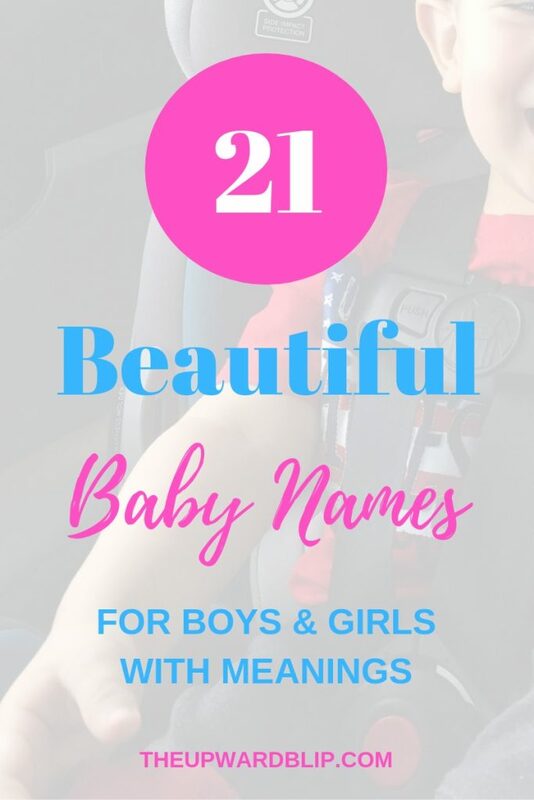 If you want to keep it traditional yet unique, you can always pair this boy name with a classic middle name. Sloane is a unisex name. It works great for both boys and girls, but I like it better for a boy. In Gaelic, it means “warrior”. The Celts have Sloane written in the books as a “fighter” too. Now that is the very reason why I want it for a boy. It has masculinity written all over it, don’t you agree? According to the Merriam-Webster dictionary, mico is “a black-tailed marmoset (Callithrix melanurus) of tropical South America”. If you are wondering what a marmoset is, it is a kind of South American monkey. Who wants to name their boy after a monkey? Not me. So, I dug some more and found out that Mico is a chief or a ruler among the people of the Creek Confederacy and some of their neighbors in the mid-18th century. Now that’s more like it! Costas is really a nickname. It is a short form for the Greek name Konstantino. We are more familiar with Constantine though. It means “steadfast or constant” in Latin. If you ask me, I will say that is one hell of a meaning. Wyatt is of English origin. It is an alteration of a name from the medieval times that means “brave or tough in war”. That is most definitely masculine-sounding, don’t you think? The bible mentioned Gideon as a hero. He was a military leader who defended the people of Israel against the Midianites. You will be giving your kid a favor if you name him or her after one fearless and courageous leader, right? Milo is a derivation from the Latin word “Miles” which means “soldier”. (Yes! Again! I know!) If you are looking for a different meaning of it, Milo in English means “merciful”. Don’t you want to tell people that? I named my little girl Vienna (She turned 1 in June. ), so I am a little biased with this one. It is beautiful for me no matter what other people say. My friend Lori told me it sounds like royalty. I just beam every time I am reminded of that comment. It was not my first choice, but my husband really wanted it. Quite honestly, I have grown to love it more and more each day. 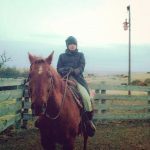 It suits my little girl, I tell you! Vienna, as we all know, is the capital city of Austria. It is dubbed as the “City of Music” and the “City of Dreams”. It’s kind of like my daughter. Music and dream rolled into one. Latin name “Arabella” means “yielding to prayer”. If you would want your little girl named with a baby name that is not only beautiful and amazing but graceful and lovable at the same time, go for Arabella. It just rolls off the tongue, don’t you think? This African-American name means “beautiful”. It also means pretty, lovely, and attractive. Everybody wants everything beautiful and don’t you ever deny that! Related to the names Blanche and Blanca, Bianca means “white or fair”. It can also mean “shining”. In addition, it is an Italian name. Delaney is a beautiful name of English origin with French roots. While studying this name, I found out that it can mean “child of dark defiance”. I am not so crazy about that meaning but really love the sound of the name, so I decided to research some more and came across a much better sense. It said this name can also mean “dark challenger”. Better, right? This name is of Latin and Italian origin which means “star”. Should I elaborate? That’s what I thought! Reina is the Spanish term for “queen”. Need not say more! The first thing that comes to mind when someone mentions Coco to me is the ever fashionable Coco Chanel. Initially, this was only a nickname for the French name Nicolette. Now, more and more parents are slowly baptizing their little girls with this name. I must admit, it is brilliantly distinctive. A variation of Isabel, Isabella is of Italian origin meaning “devoted to God”. Isn’t it lovely? 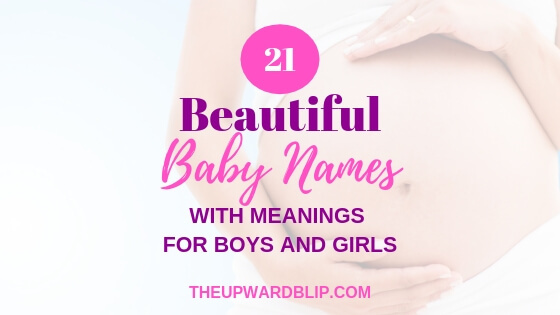 I really enjoyed looking up for uniquely beautiful baby names! The best part of both my pregnancies was actually researching for charming names and their meanings. If you think there is some more meaning to these names that you want to add, reach out to me at theupwardblip@gmail.com. I personally check all my emails and I reply quickly most of the time too. P. S. Don’t forget to look around and check out some of my other articles related to motherhood and baby like the ones below. Lol! You’re right! These baby names are really unique. I am actually considering one of these baby names as a middle name for my 3rd baby. Thank you for stopping by, Jenna! I’m glad you like the baby names! They sure are great names! Did not notice that I am a star. Glad to see the meaning of my name. Stella is the name I always like without knowing that it means star. Thank you for the great post. You are a star, Stella! 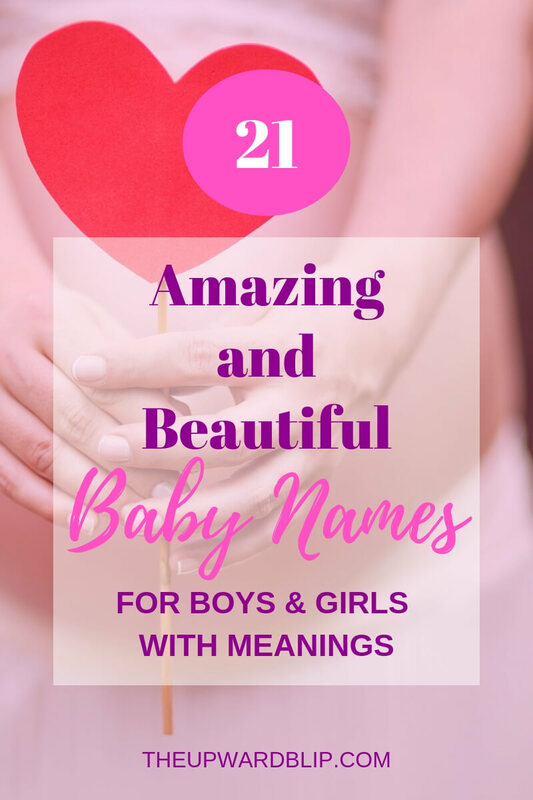 I have always loved researching baby names and their meanings. Stella is such a beautiful name to pass up. Thank you for stopping by! Lol! Do you plan to have more, Kate? These baby names are just some of my favorites. I can add on some more uniquely beautiful names that you want to suggest too. I love unique names with meanings! We chose Greyson for my son since the Irish/British meaning is son of Gregory or sone of gray hair. Which my husband is Gregory AND he is sprouting grey and white hairs 😂😂. (He is also half Irish/welsh) so it was perfect! I will have to keep this list in mind whenever baby two comes around 😉. Awww! I can’t wait for baby two to come around! Isn’t it funny how we consider our husbands ancestry when naming our kids? Like what I have said, my husband is part Italian and German. Thank you for being here, Justine! These names are all so different! We went super classic with our boys…Lucas and Nathan! All different, I know… I so love unique names. They sound so beautiful yet classy. Thank you for stopping by, Elizabeth! Thank you, Page! That is the goal!